Lug -> between the caps helps. Another thing is that those 2N5088s should be reversed. Started to probe the circuit - just to find out what causes the quiet behaviour. Probed around, and all the transistors seemed to work fine. So i tried again without the probe and it works. Really good sounding trem. I sold my Schaller back in 2001 and now i have it back! So. Reverse the transistors and take a jump wire from center lug of the spdt to the third row, between the 22u caps. Guess i verified this :) Thanks again for everything! Layout altered to suit (and made 1 column smaller). Thanks for verifying. the switch on the layout, spdt on-on right? Would I be able to add an LED to flash in time with the trem rate on this one? Yes, take a wire from the collector of Q4, that gap on the right hand side will do the trick, 2K2 (or whatever resistor you want to use to make the brightness comfortable for you) in series to the LED anode, LED cathode to the switch to ground. Then it will only blink when the effect is on. Hi IvIark, what do you mean about "that gap on the right hand side will do the trick"? Should the wire go from Q4 collector to...? There's a spare hole, third row from the bottom on the right hand side. Solder one lead of a 2K2 in that hole (or whatever value you like for your LED current limiting resistors) and the other lead to the LED anode. LED cathode then goes to the stomp switch as shown in the offboard wiring diagram so it's switched on and off with the effect. So when the effect is stomped off the LED will be off, when it's stomped on the LED will flash at the rate of the tremolo. Using BC549s for the transistors. These will work right? Pinot is the same order just flipped around. just finished earlier today, sounds great. Now I need to house it. Going to try desperately to fit it in a 1590A. Probably not going to happen though :( the board will fit fine, but I have my doubts about the jacks and pots. haha ill let you know how it works out. Awesome job! That looks excellent. This sounds great! thank you for posting. Now if I could only get some of my other vero projects working. Glad you like it. Are you having some problems with some of the other layouts on here? If you are let me know on the appropriate threads and I'll try to help you out. Hey, I've built this and sounds beautiful (very nice tremolo). Thanks for this tight layout. But I get a _very_ loud pop every time I switch it on or off. I wired my LED to Q4 collector and first I thought it makes the popping so I disconnected it entirely. Still pops very loud. And the strange thing is if I place the Heartthrob first in my effects chain after it's first switch on every pedal later in the chain pops similarly upon switching. This holds for a few seconds (like a capacitor discharging - the pop gets quieter). After that every pedal in the chain remain popless until I switch on the Heartthrob again. Seems like a capacitor in the circuit holds a charge that gets into the signal chain and causes these pops on pedal switching. Very strange. Oh, and none of my previous builds (quite a lot) does this besides I used the same regular 3PDT TB wiring scheme in all. Add a pulldown resistor to the circuit. There's not a lot of room on the board but you could solder it directly on the switch between the permanent ground lug for the LED, and the board input lug. Thanks for the pointers, I will share the results. 470k pulldown on input and 470k pulldown on output solved all popping problems. Great tremolo, great layout, great work Mark :) Thanks a lot! Finally gave up on the swamp thang and made this one and whooshhhhh.....it works at first go. But one problem is the dwell knob works well till 85% of its rotation, after which there is no tremolo effect, I am just getting a clean signal. I am using a 22k Pot, is it because of that or some other reason. Any light? Some kind of wrong resistor value, bad solder joint or invisible bridge between some strips could be the reason. Tremolo effect on this design is based on low frequency oscillation that controls the pulse applied to the signal. Dwell pot adds resistance when turning it counterclockwise, so once you are not giving enough resistance to the oscillation, it just flips over the edge and stops oscillating. You could try to add 3K9 or 4K7 resistor in series before dwell pot's lug 3. But since i've built this myself i know for a fact that the layout is good and i didn't have any problems like you mentioned. Before adding anything, you should check for bridges and if all resistor values touching that pot are correct. Nearly invisible bridge in right (read wrong) place can lead to all kinds of crazy behaviour. ...it just flips over the edge and stops oscillating. Well. It doesn't stop, but it's frequency gets so high, that it doesn't affect the signal anymore. Thanks mirosol. I checked. There is an invisible bridge between row 3 and row 4, tried like crazy but couldn't find it, but the DMM is beeping. And I didn't have 330k, so had used 270k instead. Maybe because of either or both this strange behavior is happening. Will try and rectify the exact fault. I'm a bit ashamed to admit, but i give the knife to every circuit that i build. I use this small hobby knife to go through every line between rows. Just to be sure. Maybe i've just battled too many times with barely visible solder bridges. Once i started doing that, 5 out of 6 boards have worked straight away... Same thing with measuring components. Those are dull tasks, but save you from a lot of trouble when it's supposed to be finished. That 270K might have a little something to do with that too. It's controlling the current to the base of Q1, which is responsible for that dwell's amplitude. Also 270K is about 15-20% less than 330K - a bit more than Mark uses for base rule - the 10%. Finally checked for bridges, couldn't find any; then I removed the 270 k and soldered a 47k along with it to make total resistance 317k. Now the Dwell knob is working for almost 98% of its rotation but the last bit of rotation is flattening out the signal. Now I will add the resistor to the Dwell knob. I also checked the Pot value and it showed 25k only; so I am a bit perplexed as to what to expect after adding the resistor. I also wanted to know, in my earlier build of a fuzz face I had noticed the tonal quality changed a lot when I put the board in the enclosure , than the tone I got when testing it on breadboard.Could it be the breadboard which is the culprit? This resistor is not in the signal path in the way that changing the value would just change frequency response a bit - it's controlling the current getting to the dwell control. That's why i think it's important to get that value right. Presently I am just wiring the soldered board through a breadboard, where in my input wire goes to the input socket wire on the breadboard, similarly the output wire goes to the output socket wire on the breadboard in the same columns respectively. The 9V supply line goes to the 9V battery input row on breadboard and all grounds go to ground line on breadboard. I will try and add another 10-15k and see the difference. I experiented a lot with this as I really like the sound of it. I think in this current form the Dwell pot is not really useful or musical at all. Until 80% CW of it's rotation it cuts almost all the signal so makes the effect choppy. Which is kinda cool - for an extreme. Above 80% starts a useful range but hard to tweak - too sensitive. So I replaced a few components to make it more sensible. Now the Dwell range is better. From very choppy (fully CCW) to kinda inbetween (middle positon) to no tremolo effect at all (fully CW). Just wanted to share for those who feel like me about the Dwell range. built this tonight - after building the vox and battling with it, the ea tremolo, the vico vibe etc.. this one works, and works well.. finally have a great tremolo! anyone played with this to get it more square wave? OK to use a 2N3904 for this build? I have some laying around. A 2N3904 should be fine. I'm still a little confused about the pull-down resistor. Do I need to do one for the input and one for the output? For the input can I just run it from board input to board ground, and for output from board output to board ground? Or is the pop in this pedal from the LED? In which case could I just wire a resistor between the LED ground (on the switch) to Input (on the switch)? great, thanks! I'll try the output first and see how it goes. Thanks for everything! I'm not super-chatty, but I gotta say I've had a blast building these projects. I figured I'd post a few builds that I've finished. Thank you for all of your work. Hi Ivlark, I have done this tremolo and it worked much better than I thought. I wired a 5mm LED to indicate the rate, but somehow, the switch came with a really loud pop. I soldered a 3M resistor on board connnecting the input and the group, but it still happened. Therefore I reckoned I should try another way as "http://www.muzique.com/lab/led.htm" suggested. But this time, the LED just kept all the way on and wouldn't blink along with the rate. So I was rather upset, 'cause I had to turn down the volume on the amp every time I needed to kick the tremolo on. Here is the way that I followed to wire the 3PDT. Appreciate your layout and wish you could help me get rid of the annoying pop. Thanks a million! And this is the pic of the tremolo I did. I think Geiri solved his by taking a pulldown resistor (try 1M) from output to ground, rather than from the input. The rate LED won't be causing popping anyway, and you can't use the AMZ method for rate LEDs because the charge is stored in the cap and so even in the supply's low state it will continue to be illuminated. That can only be used for the main on/off LED if you're using one. Try the output pulldown resistor and see if that cures the pop, if not it must be down to a cap somewhere so you may need to swap them until you find the culprit. Does someone know how to build a volume poti in it? Maybe with replacing one of the resistors? it would be very fine, because it sounds a little bit quieter when its on So you could adapt the sound on your amp. A volume pot won't help because it will only attenuate from it's current volume, not boost. Putting something like an LPB1 in the same box is an option, but this should be at unity volume which suggests there is a problem somewhere. Check for solder bridges or any conspicuous joints and reflow if necessary. thanks for you help. it works with an lpb1. but i have a another problem as well. its a loud plobing when you switch it on and off. you know this problem and have you an idea for a solution? Running through my test box, I get signal through the circuit. Not trem signal, just signal. Currently the speed knob is acting as a volume control and the dwell and switch do nothing. I am using 2N5088 transistors, and the only change was using a 20k LIN Dwell pot instead of a 25k LIN. I would think a part of the issue is that the voltages are too high on Q4C, almost like the resistor isn't working in that position. The multimeter reads 2.2K though. Also I think there is an issue with Q3B & Q3E going to zero. That is probably why the speed is acting as a volume control. Does anybody have any suggestions on things I should look for? I don't think 0 at Q1C is right. Have you tried swapping transistors (did you use sockets or solder directly to your board)? If you connect a battery does it get warm? would indicate a short somewhere. The other thing to try if you have already re-soldered and inspected for bridges is to run a razor (hobby knife) down each track between copper pads to make sure there is no wisps of solder not easily visible even with magnification. The other suggestion is to re-trace your components and make sure each is in it correct spot and with the number of elctro caps, make sure the are facing the right way. Did you connect the SpDT? Did you install the jumper from C21/R3 to C21/R11? I built this tremolo last week with tantalum capacitors and 2n2222, it worked perfectly for 3 days then died slowly. So i built it with electrolytic capacitors and 2n2222, now it is working properly but compared to the first wich was crystalline, this one loses in high frequencies,can i fix this problem? 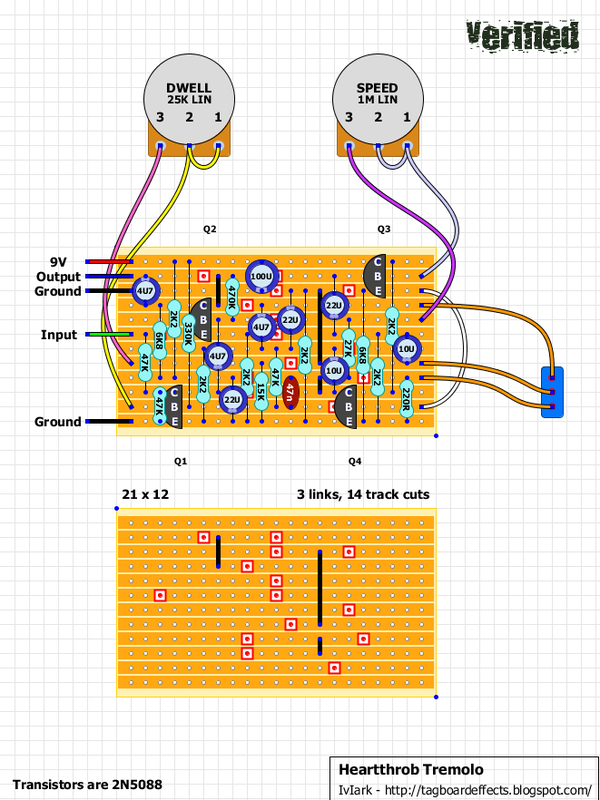 Hi there I'm new to veroboard and pedal building and I'm trying this layout. It's REALLY quiet so I'm thinking I've done something wrong. Are the ground strips meant to be electrically common? If so, do I need to bridge them? If not, which do I hook the negative terminal from the battery up to? All the points of ground need to be connected together. Both points on the board, input/output socket, stomp switch for LED, negative terminal of DC adapter/battery. Just daisy chain between them all, one wire in one wire out, or take them all to a central point like the input socket sleeve which will take quite a few wires and is sturdy enough to be able to take plenty of solder. OK, thanks. I've tried that but it hasn't seemed to help. I've double checked the positions of the components and checked for bridges between the strips. I've double checked the resistors - the one on C13 is measuring 2.19k off the board but on the board has a is only 0.19k? Here are the voltages on the transistors. I'm using 2N5088 and the battery is 9.22v. Also, my 47n cap (47n j100) is rectangular not like a brown circular ones I'm more familiar with - does this make any difference? Well you obviously have some problem early on in the circuit. Q1 looks ok but Q2 should have a voltage reading on the collector and emitter and it should be higher on the base. That makes me think there could be a misplaced (or incorrect value) component. Could you post a high res front and back board pic? The type of cap doesn't matter as long as it is the correct value. Agh - I see it now. I will be sure to use your overlay technique to check my layouts in the future! The effect sounds great now. Thanks for your awesome site and sorry for wasting your time! The effect works now however I am hearing some faint-but-definitely-present noise while it's switched on. Does anyone else find this circuit noisy? It's in an aluminum enclosure - I'm guessing that eliminates outside sources of noise. Its my first build and it's a bit messy inside, which I suppose might contribute. Any thoughts? This circuit isn't noisy at all. I've made a few of them. I've never had a problem with noise because of messy wiring but I've heard of people saying that signal wires close to power wires can cause noise, if I remember correctly. Is everything grounded properly? On second thought it's pretty quiet; I can definitely hear some noise with headphones but through the amp it's not audible. I'm calling this one done & a success! Thanks! Just built this. It sounds lovely. Thanks for the layout! Okay, so I decided to play with this thing a bit. Sounds fantastic, but I now realize I'm getting a huge popping sound when switching the pedal on and off. I tried adding a 2m resistor from output lug to ground, Nothing. Then input lug to ground, Nothing. Then LED Ground lug to Input, Nothing! just built this and works very nicely except that the useable range on the dwell pot is only between 75 and 85% CW , below 75% sound is very low(I guess because the dwell is pretty much 0) above 85% the tremolo effect is pretty much non existant - in between the tremolo goes from gentle to helicopter ! as noted previously by others, both knobs are not very usable until about 60-70% of their range.. would using log pots help here? As you can see from the above post I used mine reversed in error but found after I had replaced the dwell pot with a 20k and added the multi turn trimmer instead of the 15k resistor - it's spot on now! My speed pot is still wrong according to the diagram (its 25k instead of 1M) but works perfectly so Ive left that as it is! I'm therefore guessing that its the value of the speed pot which is too high? both the pots I'm now using are linear not log. Thanks. This Trem sounds amazing! This may be a rookie question but would it be possible to add a tap-tempo switch somehow? The LED is a rate LED which only pulses when the FX is turned on. How to add a second switch? Can you guys draw it on main layout? A second switch to do what? You'll have to ask Geiri what he did. Geiri? Built one a few days ago. Used a 10K lin for the depth as this is all I had at hand. Must have gotten lucky as I've not experienced any of the issues posted above about the useable sweep of this pot. Mine goes from absolute chop to no tremolo all within the full range of the pot rotation. The sweep is damn near perfect! Although its backwards. Chop at full CCW and none at CW. Took it to a gig last night and first noticed a fierce pop when switching, made even more noticeable by my verb at the end of the chain. So I followed the comments above RE using pulldown resistors (1meg) on both the input and output of the board (theres a diagram of this in the Open Chat section of the forum. Search pulldown resistor). Glad to say that this completely solved my popping issues. Extremely happy with the pedal now. Thanks to Mark, Miro and all the contributers in the comments section for your much appreciated work. First, this board does not have pulldown resistors to tame the pop you're getting from the switch. You'll want to take 1M resistor from the board input to ground and 220K resistor from board output to ground. Those will cure the pop. Hey, I built this long ago and I'm wondering if I could add another output to make it work like a panner. If so, where in the circuit should I solder that output? Hey guys, first of all, great blog you have hear and its a great work you put in hear. I built this and the tremolo works well, though its really quiet, I went over the rows with knife and my continuety tester over and over and couldnt find a bridge or something. Though I found something rather strange, I tested continuety between the third and fourth row. Specificly between the collector of Q4 and the down leg of the 27k resistor. Is this the way it should be or might this be the problem with the quietness? I hope you can follow me. If this doesnt work I would put a boost in front of it. Anyways, how would I wire a boost in front of it? Just go with the output from the boost in the Input of the tremolo, right? No man, don't put a boost on it! I mean, at least not for this reason. First try to get it working properly! I put a boost right after mine in the same box to achieve two things: first, be able to do sweet and smooth tremolo arrangements (think of Bad Religion's "Broken" solo" or not to lose volume in the super choppy and fast effects to do hellicopterish sounds. But the tremolo itself should sound nice and with the same volume of your clean signal (unless you go veeeeeeery fast and with the dwell maxed out). Hey man, got it working, I accidently put in a j201 for Q2 instead of 2n5088. I'm glad you did! Enjoy it because it's a really nice pedal. Now you can think about tweaking it if you wanna ;). Hi guys! I Built this yesterday, have a few questions i'm not sure about. Is the layout given here at the top of the page the most up-to-date one? There seems to be alot of comments mentioning transistors the wrong way round etc..
Whats the switch supposed to do? So far it seems to just switch the tremolo effect of and on. But im not sure thats right, since the pots still effect the signal only slightly (abit of filtering or something).. When i power this with a (new) 9v battery the signal is terribly week, with a power brick it works mostly ok. Is this expected? Im confident i have soldered this right so.. im pretty sure its not that which is making problems for me. Thanks so much guys, I really enjoyed putting this together I hope I can get it to play ball. Yes, this is an up-to-date one. As far as the transistor position goes, it's always best to look at the datasheet from the manufacturer for the correct pinout and not rely on the diagram's drawing. The switch changes the tremolo rate, which can then be further adjusted by the speed. There's two different ranges and the switch changes between those. I tested my build of this with a 9V battery outputting only 6.8V and it sounds great. I'm sorry to ruin your confidence in your soldering, but my guess is you've either got a short somewhere or have a resistor/etc. in the wrong place and just aren't seeing it. Those can be the hardest to spot, but it's happened to me a few times. I would back-trace from your switch, since that's obviously wired wrong, and see where something's not right. You can also post your voltages and someone might verify them or narrow down where the problem might be. Thanks so much for your help! I will certainly back trace everything now and find out whats going on. I am trying to get this build to work and need some debugging advice. 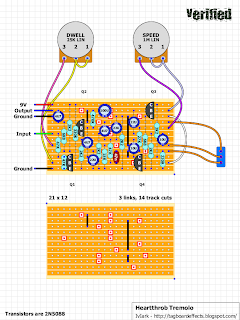 I have build several more complicated pedals by using this great site, but this one driving me mad. All I hear is a low sort of "hum" that matches the the rate of the tremolo. So when I fiddle with the knobs the trem effect is happening on this sort of hum, but the guitar sound is not audible at all. If I switch the pedal off the bypass is working fine and I can hear the guitar loud and clear. I have cleaned the board multiple times to make sure there are not shorts etc. I tried every possible transistor position (event though I followed the data sheet to make sure they were right the first time). I checked the values of each resistor etc. over and over. Finally, I even went through and replace every single component. Nothing seems to help. Does anyone experienced something similar or have an idea of what might be wrong? Can anyone think of a reason why this pedal would work fine with my guitars (Gibson SG/ Fender Strat) but not work correctly with a friends guitar (Carvin w/ active pickups). When my guitars are plugged in it works fine, plug his in and it only passes signal when the intensity is dimed and even then it doesn't sound right at all (same rig). Could his active pickups cause a problem like this? Anybody found a solution for the true bypass popping on this one? Build it. Great tremolo. "2N5088s should be reversed." Nope! That was before the layout was revised, back in 2012. Transistor images are currently correct. Ive only got B500k and B50k pots, thats as close as ive got, Im gonna go ahead and build this tonight, i guess if it works ill see how the pots respond, but if anyone sees this tonight and could reply with resistor values that would make it work better with this combo thatd be Swell:) If i can get it working and there isnt a way to make these pot values useful and i dont get any replies ill go ahead and order some pots. Got all the OD and Dist i need, but with any modulation seems like i never have all the right pots or trannys or FETs....Ive got so much stuff and im pretty disorganized and its become a mess of parts all over the place that i just cringe at adding to it until i get everything organized. Any way awesome site, thanks! Just put this one together and having a little nightmare with it. First I had no signal, which was fixed with a scalpel down the rows. However now I basically get clean signal, the same problems that Dan Shumacker seemed to have earlier in the comment chain. I tried reversing the transistors, although I was pretty sure they were correct, which just made the signal overdriven. I've double checked my layout and it's correct. I'm quite new to electronics in general so I'm not sure how to start troubleshooting outside of double checking positions etc. Does anyone have any tips on what I should do or what I should probe with a meter to at least give me some idea of where to go? I don't want to give up on the circuit! Thanks! Having built this on vero I've built another one using the pub layout on the 'perfect and PCB layout site. Although this works my only problem is that the rate switch has no effect at all. Done the usual checks but can't find the issue, anyone have any ideas? For what it's worth the voltages at the switch are SW2 0.01-0.09 and SW3 0.02-0.33 with both pots at max. When the pedal is on, I hear loud "beating" noise in the same rate of the tremolo. The normal tremolo output and the noise are in about the same amplitude. When I plug out the guitar input (and the pedal is still on) the noise stopps. Does someone have any idea what can couse this kind of beating? Hello friends, I have set up the circuit and when the effect starts it works but it loses a lot of volume, besides the potentiometer dwell seems not to act. I've reviewed everything and I do not know where the fault may be. Has the same happened to someone? I just wanted to say that I had the exact experience as rizibiz that he posted way back in June 2012. In fact, mine was so choppy for most of the DWELL pot sweep that I thought it was defective and I rebuilt the circuit, only to get the same result. Anyway, my method of dealing with it was similar to his. I replaced the 15k (from DWELL 3 to GND) with a 10k. Then, I strapped a 20k resistor across lugs 2 and 3 of the DWELL pot to roughly simulate a 10k pot. The sweep isn't perfect, but it's much more useful to me than the stock setting was. Hi everyone, first time posting here. I'm having a similar problem to Adrian except i did use the layout on this site. I've already knifed the traces (even double checked continuity) i've even replaced almost all of the components except for the resistors. 1.- The tremolo effect sorta "works" but only on the slow setting but is very muffled and quieter than when bypassed. 2.- The loudness of the effect varies, it usually starts a little bit louder but suddenly becomes quieter till the tremolo effect is gone and you just have a very muffled version of the clean signal. 3.- When the switch is set to fast mode you can hear the tremolo effect change speed but only for about a second than it fades out and then the signal becomes quiet and muffled. Hope anyone has any ideas i've been going crazy tying to fix this for almost a week now without any luck. I've reflowed all solder joints and reviewed the component placement a ton of times. Man-cave back up and running!